11 December 2008 – Put a spring in your step and help to enrich your life in 2009 with the fun new Nintendo DS software Walk with me! Do you know your walking routine? set to launch across Europe on 20 February. A good active walking routine is recognised as an important part of a balanced and healthy lifestyle. 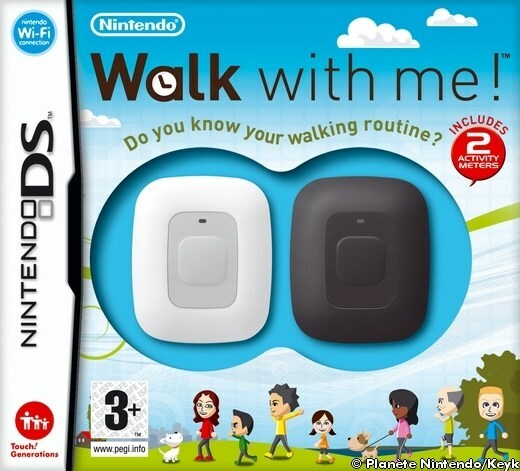 Now Nintendo’s Walk with me! can help you to get in tune with your personal walking regime, compare it with friends, family or even your pet, and see how you compare to walkers across the globe! This latest lifestyle software designed exclusively for the Nintendo DS comes with two specially designed pedometers called Activity Meters which measure your daily steps minute by minute. Slim and convenient, the Activity Meter will fit into your bag or pocket as you walk and will measure your activity through the day. You can set daily walking targets with a basic setting of 3,000 steps which can be increased each day to suit your activity levels. The data is collected and stored on the Activity Meter for up to seven days and can be easily transferred to your Nintendo DS, so you can track your progress. Simply point the Activity Meter at the Nintendo DS like a TV remote control and with one click of the button on the meter, your data will be sent by infrared signal. With the ability to store data for up to four users, you can compare your activity with other members of your family or friends– even ranking yourself against the family dog! Walk with me! also offers a variety of fun mini-games to help motivate you to walk. You can use your collected steps to unlock trivia, create images and find out how much electrical energy your walking would have generated for the day. Using the Nintendo Wi-Fi Connection, users send their step data to compare with people all over the world and there are two other great ways of bringing your walking routine to life and sharing the fun. You can post your own step data to combine it with users around the world and create a world step count. This is then used to plot a virtual walk across the solar system. The distance between planets has been calculated in steps and you will see graphically how you and other world users are doing on your journey through space. Every Sunday the walking rankings for all users will be updated on a global scale with an interim ranking every day covering total steps, highest step count in the world and the previous week’s step count. Anyone who then updates their game will be able to view the world’s top ranked players and how far they have walked. Walk with me! is easy to use and will bring fun to your daily walking routine helping you in your journey to a healthier lifestyle. Step on up and get your copy now! Walk with me! Do you know your walking routine? launches across Europe on 20 February 2009. Thanks to NintenDaan and Keyk for the heads up!